My Early World Literature students generally love Sappho, at least what of hers we read in the course. And I think some of what they love is her unknowability, if I can call it that, and the fact that much of the work we have by her is fragmentary. Her works were collected into volumes by admiring Greek and then Roman poets and others, but only papyrus scraps have come down to us, through various unusual pathways. She was born around 615 B.C. to an aristocratic family and lived for a time in a community of young women on the island of Lesbos who wrote and sang poetry, danced to their songs…. the word “Lesbian” was attached to the female-to-female sexual attractions described in some of her work. The site The Poetry Foundation sums up what is known or at least seriously believed about her today: “In antiquity Sappho was regularly counted among the greatest of poets and was often referred to as ‘the Poetess,’ just as Homer was called ‘the Poet.’ Plato hailed her as ‘the tenth Muse,’ and she was honored on coins and with civic statuary.” Beyond that, most of what we “know” is custom, legend, speculation…or downright fiction. Readers tend to believe her first-person poems are autobiographical because of that “I” and the frank, intense description of deep emotions and suggestions of intimate experience—but we don’t know. Oh, the use of the passive voice, which denies Sappho agency in her own work (the poems were written on an island; who wrote them remains unspoken)! Oh, the strange notion that some “compilers” made them into classic poems—again, she doesn’t seem to have had anything to do with it! Were they immediately classic because they were written in the sixth century B.C.E., or are they classic now because they’re still around or because we call them so, or are they classic because someone compiled them “into…classic poems,” or what? The writer leaves us to ponder those questions. Perhaps the writer himself is unsure what “classic” means. They can certainly be referred to as “classical,” because they are writings from the long period of Greek and Roman civilization we call the “classical age.” Well, be that as it may. They’re classics today. “Despite knowing not much about her,” besides being a remarkably awkward phrase, is a dangling modifier. Of course I knew what he meant to say: Despite the fact that we don’t know much about her…or despite our not knowing much about her. But the sentence as my student wrote it has no such nouns or pronouns to be described (modified) by the prepositional phrase: the only noun offered is “poems,” but surely he doesn’t mean to say her poems don’t know much about her. He goes on to say that the poems “speak volumes.” This in spite of not knowing much about their author, I guess. Now, generally when we use the verb phrase “speak volumes” we mean “say a great deal (books’ worth, in fact) even without words.” As in “she said not a word when he said he loved her, but her quiet smile spoke volumes,” perhaps. Is that what my student means to say about the poems of Sappho—that the fragments we have still suggest books’ worth of thoughts? I’m not sure. In view of the introductory phrase about not knowing much about her, I have to consider that he may mean the poems suggest a lot about their author. What’s truly odd here is a coincidence of terminology, the juxtaposition of fragments and “volumes,” and the association of poems with books as well. Most readers of Sappho feel that the fragments suggest deep and complex emotions, or evoke them in readers, although for many of the poems what we have is so small a piece of the probable original that we can’t be positive where the poem as a whole might have taken us. In fact, what we respond to for so many of what we call her “poems” is a single breathtaking image. And the trouble with that is the nagging fact that almost all of us are reading Sappho in a translation. Only the knowledge that her words have struck readers this way regardless of the passage of time and the vagaries of literary “style” and translation gives us the confidence to attribute our response to her artistry. This isn’t a very funny post! My intention was to have a good time with my hapless student’s staggering couple of sentences and their inadequacies as praise of The Poetess. But it’s impossible to point out where my student went wrong, or at least limped through, without talking about the power and beauty of the words he was trying to respond to. Perhaps there’s a point at which we all become inarticulate. Here’s someone else’s tribute to her. 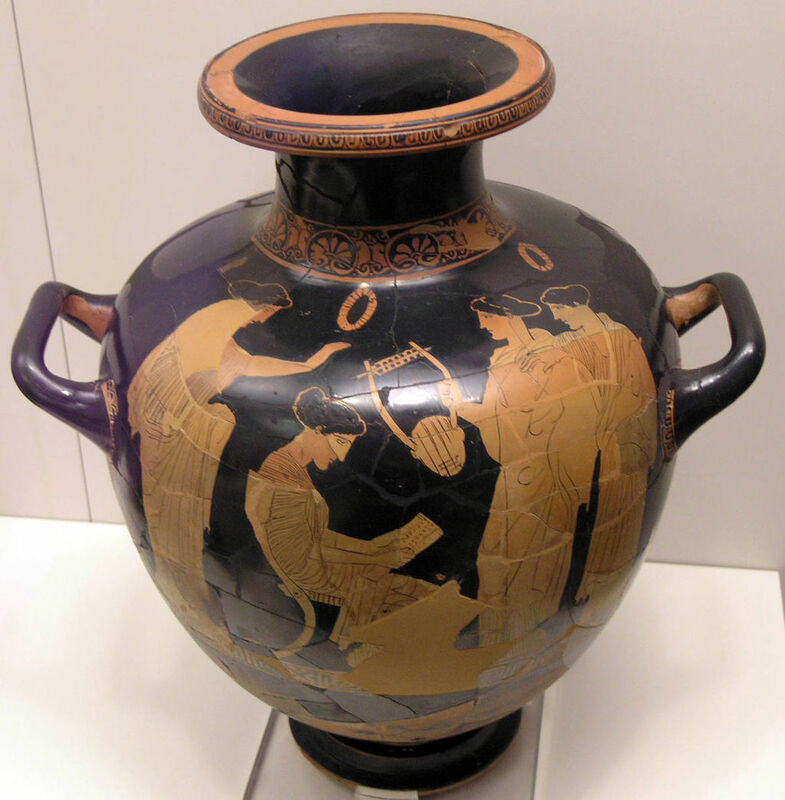 It’s described as “red-figure vase (hydria, or kalpis) by the Group of Polygnotos, ca. 440–430 BC. Seated, Sappho is reading one of her poems to a group of three student-friends. National Archaeological Museum in Athens….” This photographic image of the hydria is “by Μαρσύας (Own work) [CC BY-SA 2.5 (http://creativecommons.org/licenses/by-sa/2.5)%5D, via Wikimedia Commons.” She’s writing so intently, and the other women form a group around and above her that seems simultaneously loving and blessing. Beautiful, isn’t it? You’ll notice that, like Sappho’s poems, this jar seems to have once been broken. How fortunate we are that all the pieces are here, carefully reassembled, so we can be sure we’re responding to its original beauty.